A: Plans currently call for the City of Oak Creek, Wisconsin to sell water to Waukesha. Oak Creek is a community with an established water utility and excess water pumping capacity. It has agreed to sell water to Waukesha. By selling water to the city, the ratepayers of Oak Creek can realize lower rates and increased inter-governmental cooperation. The Oak Creek/Waukesha agreement is an excellent example of how governments can work together cooperatively to maximize community assets. Back to top. Q: Will the New Water Supply Program affect Great Lake water levels? A: No. Waukesha’s return flow to Lake Michigan will result in no negative impact on Great Lakes levels. The Great Lakes Compact requires that Waukesha return all borrowed water, less consumptive use, back to the Great Lakes Basin. This legal stipulation sets a positive and protective precedent for having no impact on Great Lakes water levels. Waukesha will actually exceed this requirement, and will return the same amount it borrows from Lake Michigan. Waukesha’s future average daily withdrawal will not exceed 1/1,000,000th of 1% of the volume of the Great Lakes. To put this in perspective, the amount borrowed is the equivalent of dipping out – then pouring back in – one teaspoon from an Olympic-sized swimming pool. Back to top. Q: How is the volume of return flow managed? A: Clean, treated water will be returned to the lake on a daily basis, in an amount equal to the average daily volume withdrawn during the previous calendar year. The amount lost to consumption is counterbalanced by Mother Nature: rainfall and snowmelt is treated and added to the return flow to satisfy the requirement that we send back the same amount that we borrow. Any excess water will be discharged through Waukesha’s existing outlet to the Fox River. An analysis of the years 2005 through 2012 shows that the percentage of water returned in each of those years would have ranged from 99.6% to 100.8%, compared to the volume withdrawn the previous year. Back to top. Q: Who benefits now that Waukesha’s request is successful? A: Great Lakes supporters, environmentalists, proponents of good government planning, fishing enthusiasts, public health advocates, and the citizens of Southeast Wisconsin. Of course, residents of the City of Waukesha, who need a safe and reliable supply of drinking water, will also benefit. But in a very real sense, every person who lives and works in the Great Lakes Basin area will gain from knowing that the Compact Council was able to balance the need for access to clean drinking water with the imperative to maintain environmental sustainability. Waukesha’s application proved that the Great Lakes Compact works. Back to top. Q: Is Waukesha a precedent for hundreds of additional diversions? A: No. Very few other communities are likely to apply for diversions under the Great Lakes Compact. The Compact bans diversions of Great Lakes water. The two exceptions are for Straddling Communities and Communities in Straddling Counties. 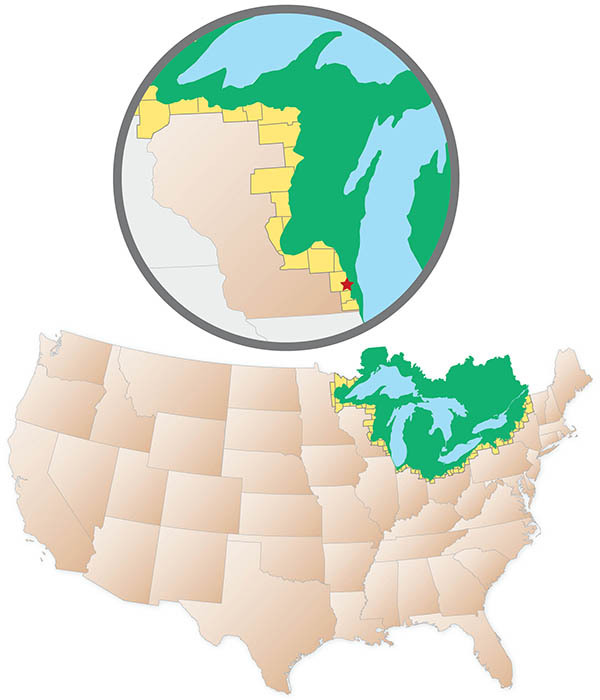 The strict criteria require that the borders of the community itself – or the county in which it is situated – must straddle the Great Lakes surface water divide. Furthermore, an application is considered only if the same amount of water is returned after use and treatment. Less than 1% of the Great Lakes region population is even eligible to apply. It should be noted that withdrawing and returning water over long distances is extremely expensive, and typically requires geographic proximity to a large municipal water supply within the Great Lakes Basin. Recall, too, that under the Compact, a community needs to demonstrate that it has no reasonable water supply alternative. For the small number of communities that do meet these criteria, the successful Waukesha application sets a strong precedent for protecting public health and the environment. Back to top. Q: How will Waukesha's New Water Program affect me? A: That depends on where you live. For Waukesha residents, the program will provide water that’s safe, reliable, and environmentally sustainable for generations to come. Naturally, water rates will increase to cover the expense of this vital project, and there will be additional issues to consider when ground is broken in 2019, and as the actual changeover approaches. For communities along the pipeline routes, there may be some inconveniences during construction, but we are developing plans to minimize those impacts and to ensure that the public is well-informed. For residents of Oak Creek (as well as those living in Franklin and Caledonia, communities that also get their water from Oak Creek) the sale of Great Lakes water to Waukesha will provide additional revenues that could result in rates that are lower than they would have been otherwise. The Utility is already preparing outreach and guidance for all citizens who will be impacted by this important initiative, and is committed to keeping the lines of communication clear and open throughout the process.